The City of Elk Grove has promised to deliver the results of an audit currently underway examining the racial and gender makeup of the City's workforce, including the Elk Grove Police Department. 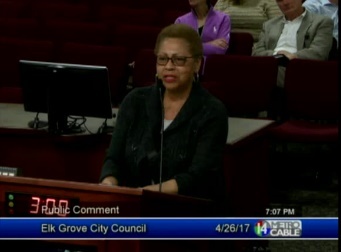 The commitment to present the findings at the May 10, 2017, meeting of the Elk Grove City Council came during their Wednesday, April 26 session. The audit came after several Elk Grove residents and representatives of the Sacramento chapter of the NAACP sought an examination of what they characterized as a lack of diversity with the city's workforce. Those requests came during the February 22, 2017, City Council meeting. Among those speaking at the March meeting were NAACP Sacramento Chapter President Betty Williams who said she did not understand why there was not more workforce diversity given the ethnic and racial composition of the City. Williams and others urged the City to undertake an audit of the city's workforce and hiring practices. "I am asking you to do an audit," Williams said at the February meeting. "The City needs to do better, and I don't understand why you are not." As a follow-up to promises made by Elk Grove City Manager Laura Gill at that meeting to undertake the audit, the chapter's Second Vice President appeared at the Wednesday, April 24 Elk Grove City Council meeting seeking an update. "We are trying to get a little status of the audit requested from the Council, Alaine Murphy-Hasan said. "We want to know where you are, is there a report coming out soon." See video below. Addressing the request was Gill who promised to provide the findings of their audit at the May 10 City Council meeting. Murphy-Hassan also noted that NAACP representatives also met with officials from the Cosumnes Community Services District (CCSD) who also agreed to examine their workforce composition. The CCSD, which provides numerous services including fire fighting has also been criticized for their lack of a diversified workforce. Following the February meeting, the NAACP held a workshop in Elk Grove on the city's workforce diversity challenges as well as other issues of concern for the civil rights group. At that March 30 meeting, participants outlined several goals for the group locally, including greater visibility. Unlike the Cosumnes CSD Board of Directors, who upon the initial request from NAACP leaders, immediately called for an independent audit, recognizing the need for the CSD Fire Department to be more diverse, and their willingness to address the problem head on, the Elk Grove City Council and City Manager Laura Gill opted only for an internal audit. There is much more to an audit of this type than categorizing employees by their ethnicity. A diversity audit should begin with ensuring that everyone – from the Council itself to upper management on down – has a thorough understanding of laws governing diversity recruitment, including affirmative action planning and equal employment opportunity hiring. Do they have that internal expertise? We shall see. Quis Custodiet Ipsos Custodes from the novel Watchmen. "Quis custodiet ipsos custodes.” Loosely translated, "Who watches the watchmen?"